Working as a commercial fashion illustrator in Los Angeles for the majority of the decade, the 1980's were formidable years for now internationally recognized artist Manuel Nunez. While New York continued to be the center of high fashion in the United States; Los Angeles, with its celebrity driven culture, developed its own art scene. Patrick Nagel's style and imagery inspired a new generation of artists and commercial illustrators. Industries such as custom car and surf, with their highly polished finishes and techniques, were also influencing Los Angeles based artists. This glossy look became known as the “L.A. Look." Working for companies like Nordstrom, Redken, Pioneer, Capitol Records, and Levi in the 80s; Manuel Nunez developed a portfolio of commercial work that perfected the “L.A. Look” and brought him internationally known models and advertising accounts. 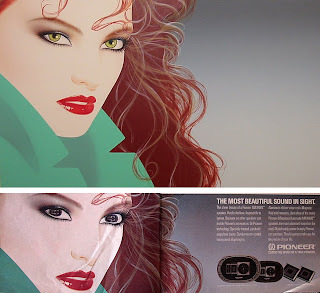 One of the most striking bodies of work that emerged from this period of Manuel's career was his advertising campaign for Pioneer Electronics in 1986. Looking to promote their electronics as beautiful designs, Pioneer hired Manuel Nunez to develop a series of illustrations that would bring a new perceived level of fashion, design and beauty to their stereo faces. Pictured below are examples of Manuel's original Pioneer illustrations paired with the finished print work as they appeared as posters, ads, brochures and tear sheets. Pictured above "If You Think This Face Is Beautiful, Wait 'Til You Hear It Sing." 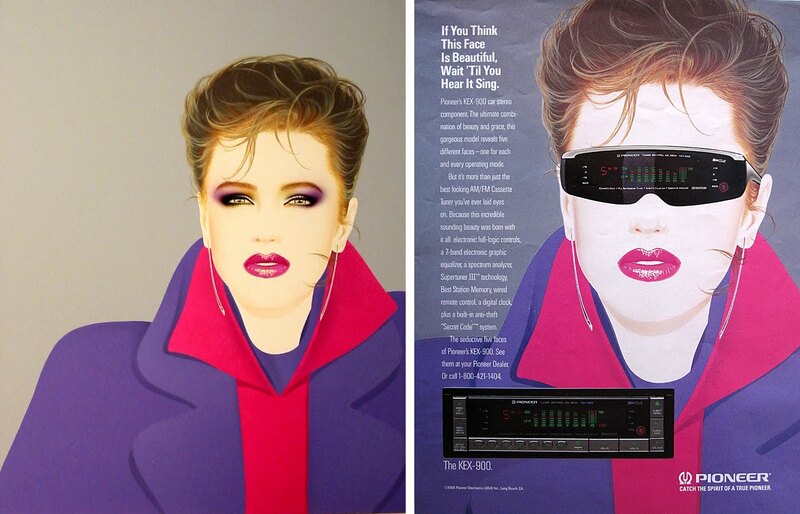 Promoting the KEX-900 this ad was released in 1986. 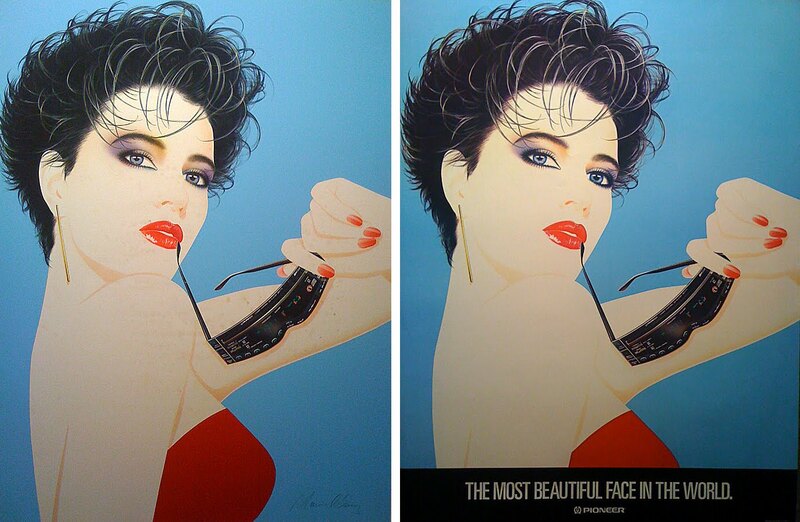 Pictured above "The Most Beautiful Face In The World." 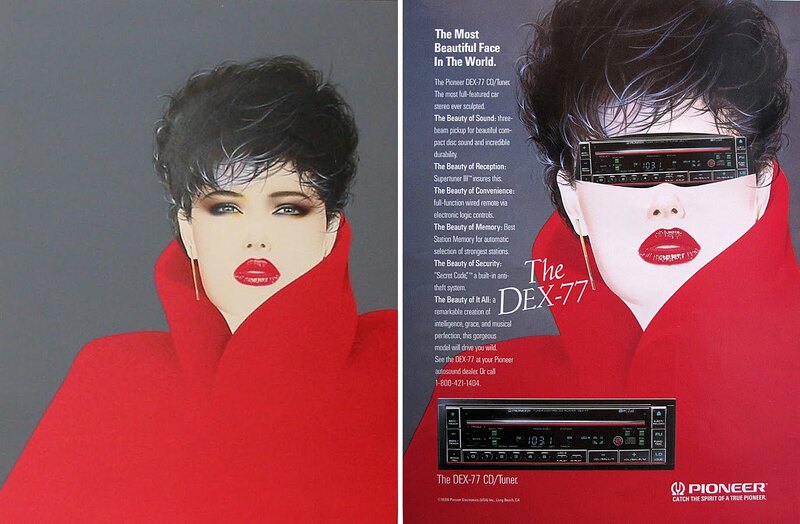 Promoting the DEX-77 this ad was released in 1986. 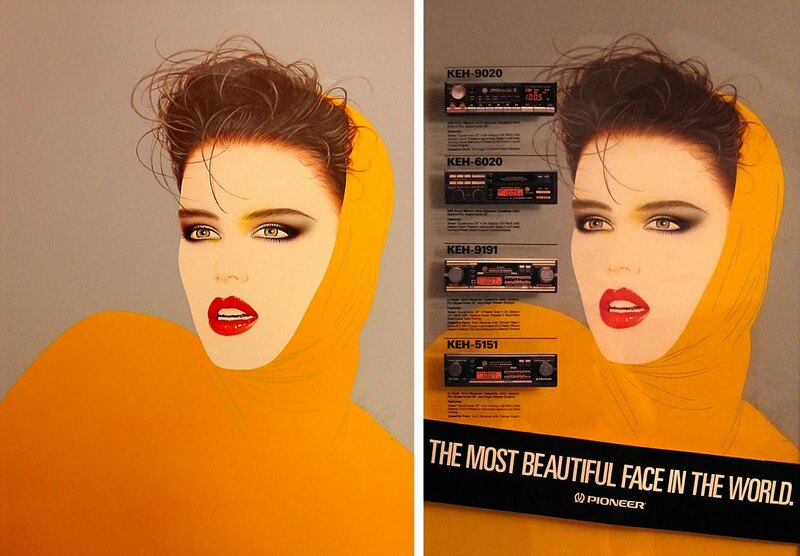 Pictured above "The Most Beautiful Face In The World." Promoting Pioneer's KEH-9020, KEH-6020, KEH-9191 and KEH-5151 in 1986. Pictured above "The Most Beautiful Face In The World." Created in 1986, Manuel expertly hand illustrated the Pioneer stereo face onto the sunglasses. 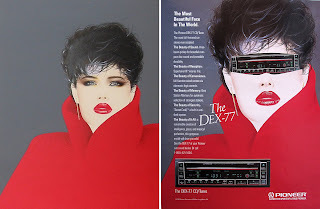 This poster promoted the DEX-77 in 1986. Pictured above "The Most Beautiful Sound In Sight." Created in 1986, this ad promoting Pioneer's Maxxial speakers appeared in a 1987 issue of Rolling Stone Magazine. Manuel's illustrations were arresting, the faces were gorgeous, the technique was flawless, the colors were extraordinary, and the tag lines were clever, but the images were ruined! Manuel's exquisitely rendered eyes were frequently covered in the finished print work. Pioneer had placed images of their stereo faces as sunglasses over Manuel's illustrated faces and speakers as irises in the eyes. By covering the eyes, the images lost the most beautiful part of the artwork, they lost their soul. Most of the original illustrations from this series were created in 1986, measure approximately 25"x19" and can be referenced on our website. We're proud to showcase a number of Manuel Nunez' original illustrations as these works embody a lost time of art and design. In many ways the tradition and soul of American Illustration was lost with the 1980's.